One of the most fundamental principles of hermeneutics is that different forms of writing typically have different goals. We must read history as history, poetry as poetry, law as law. The same is true of books besides the Bible. The same is true of the many fine books my father has written. Some, like The Holiness of God, are designed to awaken our hearts, to give the reader an existential experience of the glory of God. Others, like Chosen By God, are designed to more give the mind an “Aha” moment touching on predestination. Still others, like The Psychology of Atheism, exist to encourage us in the apologetics realm, to strengthen the mind. Knowing Scripture has none of the dramatic, immediate impact of the above named books. It is a primer, a very simple introduction to hermeneutics. And it may prove, over the decades, to be the most influential book ever penned by a Sproul. The reason is simple enough-while this book may teach us this biblical doctrine and that book may explain this other biblical doctrine, Knowing Scripture helps us understand the Bible, from beginning to end. It equips us to be workmen that need not be ashamed. There are precious few “Aha” moments in reading this book, precisely because it is so sane in its approach. The author helps us understand that in a very real sense the best way to read the Bible is the same as you would read any other book. There are no special, secret rules by which we might find special secret information in the Bible. There are, however, any number of common mistakes we all tend to make that can obscure the plain teaching of the Bible. This book helps us to recognize and work to eliminate those kinds of mistakes. The author encourages us to remember to interpret Scripture with Scripture. He reminds us to understand that which is less clear in light of that which is more clear. He warns us against confusing the historical and the didactic. That is, the Bible accurately records all manner of foolish behavior. We ought not take that behavior and copy on the grounds that, “Hey, it’s in the Bible.” As I like to explain this rule- we should understand the nature of marriage through what Jesus tells us about one man and one woman, not by looking at Solomon’s annual Christmas card picture. Knowing Scripture was first published by Intervarsity Press in 1977, and has remained in print ever since then. I expect it will remain for many years to come. Many of us, when we hear my father speak and teach from the Bible confess to wanting his gifts, his skills, to be able to do what he does. Though God gifts whom He will, reading this book is a good start at getting at why he does so well. It is brief, and of course as is characteristic of all his books, eminently understandable. When you read my father you come away having grown stronger, without having been intellectually exhausted. Get it, read it. And you won’t be sorry. 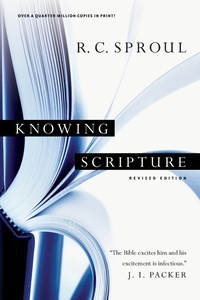 Knowing Scripture is available in the online store.